A versatile midsize SUV is great for both taking the kids to school and going on outdoor adventures. But when choosing a dependable car for your family, safety is the most important thing. Drivers in Avon, Indianapolis, and Plainfield naturally want to feel secure that your SUV is protecting you. Toyota always takes safety seriously and is constantly updating their technology to make sure vehicles like the RAV4 are always equipped with the very best. Check out a thorough review and breakdown of the 2018 Toyota RAV4 safety ratings so when you’re ready to buy, you can do so with absolute peace of mind. The Toyota RAV4 safety ratings are out, and the scores are nothing short of stellar from both the IIHS and the NHTSA. The Insurance Institute for Highway Safety (IIHS) rates individual areas of cars on a scale from Poor to Good, and then names a select few as top safety picks. To qualify as a top safety pick, a car must earn Good ratings for areas such as side crash test, roof strength, and receive a superior rating for front crash prevention. This year the 2018 Toyota RAV4 was named an IIHS Top Safety Pick. Another reliable organization is the National Highway Traffic Safety Administration (NHTSA). This branch of the Department of Transportation, rates cars from one to five stars based on their crash test results. The 2018 RAV4 was also given a 5-Star Overall Safety Rating from the NHTSA. Both of these top scores are a solid indicator that the new RAV4 is one of the safest vehicles on the road. You’ll also know what’s around you with the Bird’s Eye View Camera with Perimeter Scan. This takes the idea of a rearview camera to the next level. You’ll be able to see 360-degree views before backing out of your parking spot. There’s also a blind spot monitor so that you’ll know when you’re clear to safely change lanes. On the inside, you and your passengers will be protected by eight standard airbags. There’s front and second row Roll-Sensing Side Curtain Airbags, as well as the Driver and front passenger Advanced Airbag System. It features a driver knee airbag, front passenger seat-cushion airbag, and driver and front passenger seat-mounted side airbags. The new 2018 Toyota RAV4 safety ratings and features make it clear that this dependable SUV is designed around protecting you and your passengers. 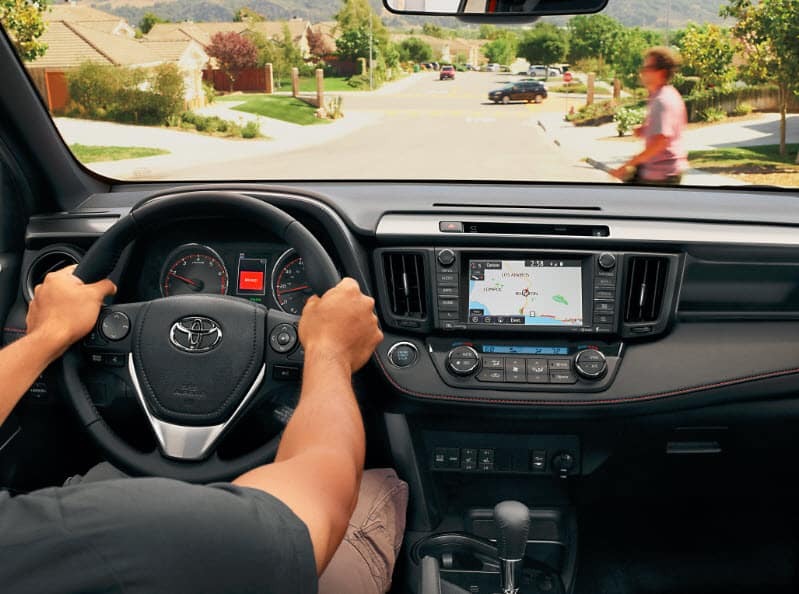 To feel safe and secure in a RAV4 while traveling around Avon, Indianapolis, and Plainfield, stop in to Andy Mohr Toyota to take a test drive today.